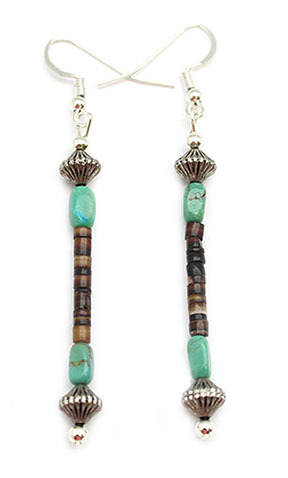 This earring is made with silver plated fluted beads, 2 turquoise smooth nugget and pen shell heishi on a silver plated french wire. It measures approximately 2 3/4" long including wire by 1/4" wide for the fluted beads. It is Navajo hand crafted by Sandra Francisco. Color shade of turquoise may vary.